The organiser, Doreen Williams (at the front, on the right), makes a final check with the participants. 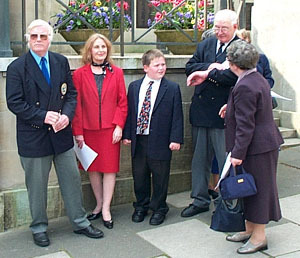 The participants are (from left to right): Edgar Evans, Kay Barrett, Tom Adkins and Harry Hemming. Welcome and Introduction, by Harry Hemming. The theme of Harry's introduction was a reminder that it was 62 years ago today that the Bath Blitz started. Some might think that after all this time, we should forgive and forget. Forgive, certainly, but we should never forget, and we should make sure that the younger generations know what happened to their city and their ancestors all those years ago. We have assembled here today to remember those relatives and friends who died, and to lay a wreath at the memorial. The reading, by Kay Barrett. That will outlast the epics of a thousand years. Carve it in marble bronze and stone. This is the measure of our greatness. Lest in the future men should fail to hold things in memory. We now pay tribute to all those who lost their lives during the weekend of the Bath Blitz, the 25th to the 27th April 1942. Edgar considered himself lucky to be here today to take part in the ceremony. In 1942, his family were living in Holloway, and on the first night of the bombing, their house was so badly damaged that they could not continue living there. For the rest of the night, they were given shelter in the Salvation Army Hostel in Railway Road. His father originally thought that they would stay in the hostel another night, so that they could go back to their house and rescue some of their possessions. But then he had second thoughts, that the house might be dangerous to re-enter. So instead of staying in the hostel, the family were taken into the countryside. And during the next night, the area around the hostel was badly bombed, and the hostel itself destroyed. God is true and he enfoldeth all the world in one embrace: with unfailing grasp he holdeth every child of every race. And when human hearts are breaking under sorrow's iron rod, then they find that self same aching deep within the heart of God. Oh God we give thanks for those who made this memorial possible. We give thanks for the gift of memory of those who died. We pray that those who still mourn will be comforted. We pray that we all shall continue to be peacemakers in these troubled times. Laying the wreath, by Tom Adkins. 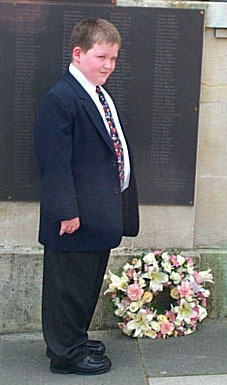 Tom laid the wreath in memory of the great uncles he had never known. The Adkins family had lived in King Edward Road in Oldfield Park, and two of them died there. Then followed a period of quiet contemplation to end the ceremony. 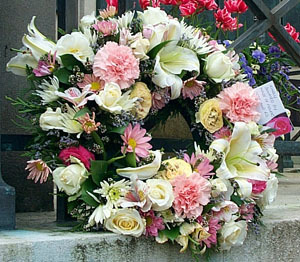 The wreath was donated by The House of Flowers. The House of Flowers was in Moorland Road, Oldfield Park. (Sadly, this shop is no longer trading). 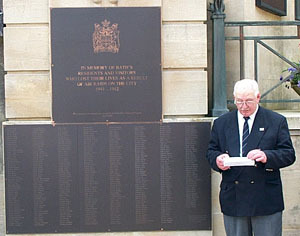 The aim of the ceremony was to allow all generations to remember those who died. This picture of part of the group of participants shows that all age groups were represented. This picture shows the wreath alongside the memorial at the end of the day. 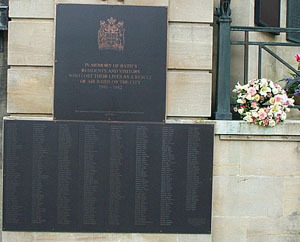 Click here to display details of the 2005 ceremony.